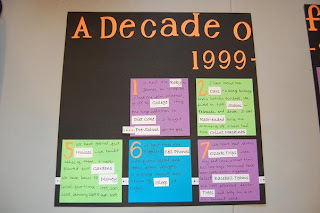 OK ~ I was getting a little tired and put 2010 on my layout title. 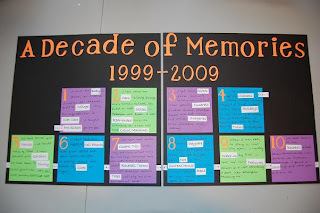 I did change it to 2009, but did not take the time to re-photo. This is my take on sketch #2 from the LID (Lay It Down) post on the cricut MB. I made the sketch into a two-page layout because I am quirky that way ~ have to have coordinating pages!! I used Blackletter for the title, Designer Calendar for the circle with 31 in it, and Wild Card for the circle. I was not going to scrapbook tonight. My oldest came home today from college for a short visit and I was not really wanting to dig out my stuff. I just checked the cricut MB to see what was going on and when I saw the sketch posted ~ I just couldn't help myself!! That is how I work sometimes...if I feel like it ~ I just do it! This LO was fun!! 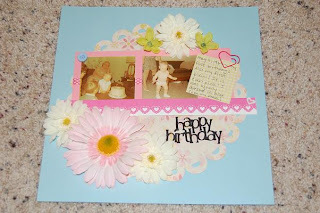 First of all, I used my new Easter cartridge for the scalloped/lace circle. I used some of my leftover Valentine's Day paper. 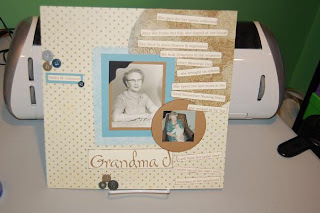 I used my new MS heart border punch. I did not have the right color of flowers (darn ~ had to go shopping) and picked up these silk flowers at Michaels! The heart shaped paperclip is also from Michaels (the same section as the fuzzy spa socks) and the buttons are also from Michaels. 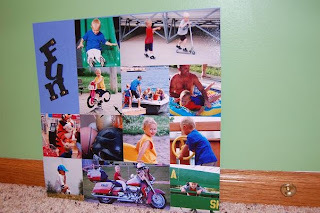 I used A Child's Year for the Happy Birthday title. 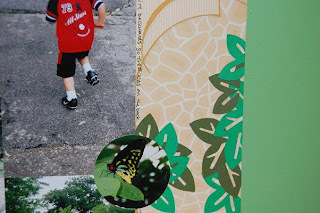 Things I learned by making a girlie LO ~ I do not have any ink (besides purple) that is girlie, the photos from my childhood have a greenish tint to them (not to mention the clothes looked funky), and I do not have enough coordinating girlie papers!!! I did not want the title in black, but I was not going out shopping more than once!! 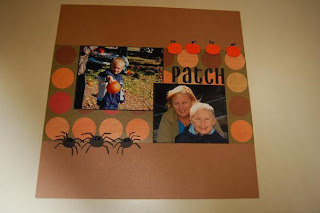 Now, I am a 2-page scrapper, so I took the negative of the scalloped circle and used it for my next page. 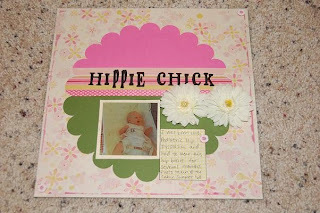 "Hippie Chick" was much easier to put together ~ not as fussy! I love the title as much as I hate looking at that contraption I had to wear!! I used the Printing Press cartridge for the title. Woo Hoo!! 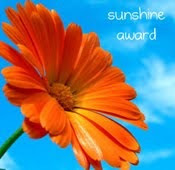 I was nominated by not one but two lovely bloggers for this wonderful Sunshine Blog Award!! 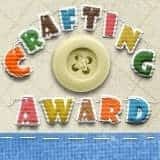 Now comes the hard part, passing this award on to six other bloggers/followers. There are so many more I wanted to pass this on to (some passed it to me and others received one already). There is so much talent out there!! This is my take on the Pratical Scrappers sketch this week. This lovely couple was like a bonus set of grandparents to me growing up. They lived one block away and had no family in Nebraska. They never had children, so they kind of adopted my parents and us when we first moved into the neighborhood. They would spend every Thanksgiving with us. Floris made home-made pumpkin pies ~ my favorite! 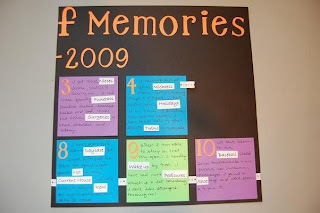 I am going to write down my memories of them for the next page ~ making this into a 2-page layout. 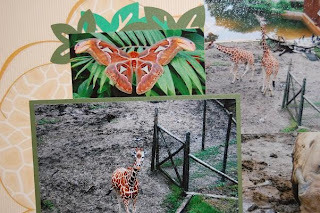 I used my Martha Stewart heart punch to make my photo border. 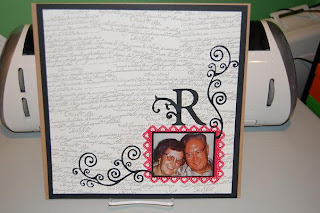 From my Cricut library, I used Gypsy Font for the letter R and Stretch Your Imagination for the "swirlies". I welded a small one to the larger one. 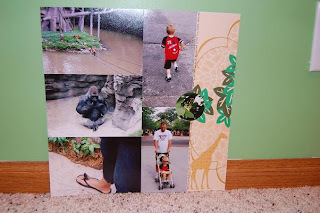 The background paper was kind of too "white" for me, so I trimmed it and added black around the edges. 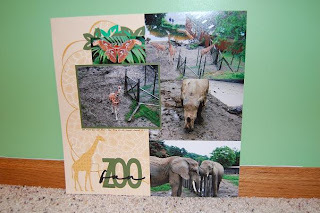 The brown around the black is just the chipboard I used to keep the page from sagging!! This project has been a work in progress for about a month. I finally found just the right paper to complete my book. Originally, I found some real cute monkey paper at Michaels and was trying to find a way to use it. I was thinking about making it into a 5 Little Monkey book of somesort for my son. 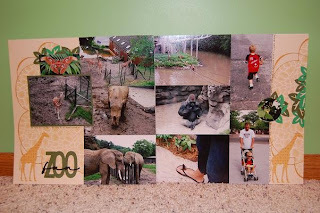 It was just not working for me ~ the monkeys were too big and I just did not get a good vibe. 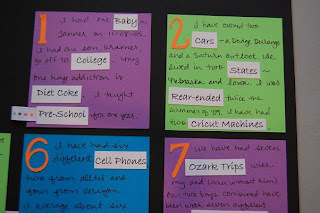 Instead I pulled out a pack of Creative Memories paper that I bought a while back. I just love these colors! 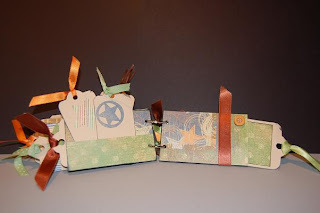 I had to get some new ribbon in just the right shades of green, blue & orange. I used my cricut to cut out the tags and the stars. I painted the edges of the tp rolls first with black paint. 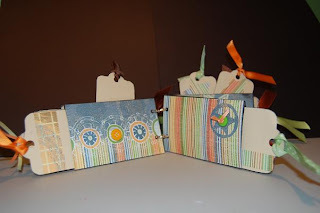 I inked the edges of the paper and tags with a stamp pad. This layout is my take on the sketch from sketches4u.ning.com. I made it into a 2 page layout because that is how it works best for me. 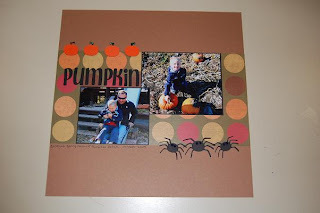 The cricut cartridges I used were: Don Juan for the title, Designer's Calendar for the pumpkins and Doodlecharms for the spider border. 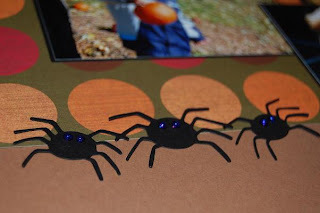 I used stickles to add spider eyes and pumpkin handles. I had my husband and oldest son draw the numbers ~ 22 won the Blog Candy pictured on my blog Congrats to MellisaAllore!!!! 43 won the second helping ~ green stickles, Christmas red stickles, journaling sticker book from remarks and a purple pair of spa socks!!! Congrats to Shari (cricutrookie) who was actually one of my first followers!! 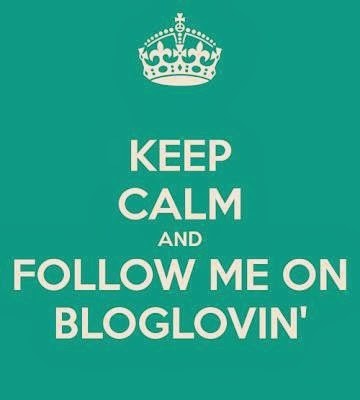 Thanks so much for your responses and blog love ~ my followers went from 49 to 111! 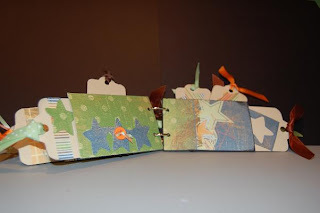 Now the pressure is on me to post some awesome projects!!! 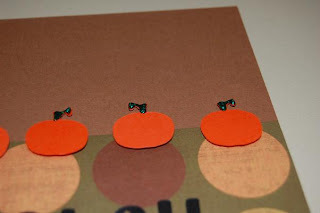 To celebrate my Bug Head on the cricut MB, I am giving away some blog candy. 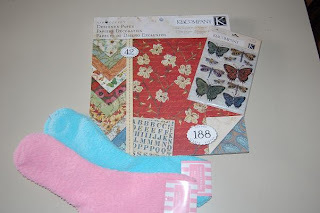 I am giving away a new K&Co pad of paper TC Blossomwood, a coordinating pack of butterfly 3D stickers and two pair of spa socks that are all the rage for cupcake gifts. In order to qualify, please leave me a message here on my blog. To qualify for an additional chance, become a follower. Please note in your message if you are a follower and a way for me to contact you. I will draw on February 19th at 8:00 pm ~ that gives you a week!! ****I have 83 followers as of 2/14 at 8:30 ~ this is amazing!!! 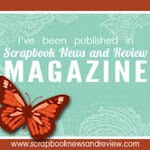 If I hit 100 followers by Friday I will add a second helping of blog candy!!! Thank you for all of your wonderful comments and feedback!! 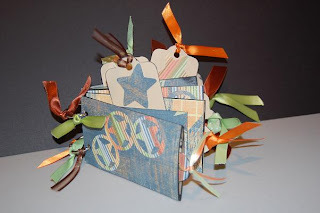 This LO is my take on the Practical Scrappers Brad Challenge this week. 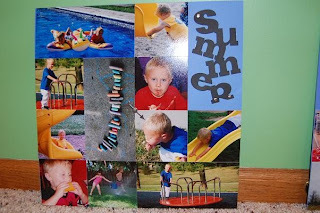 This is a collage of Tanner's summer fun this past summer. 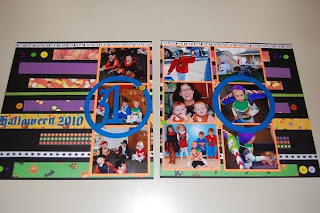 I used square brads to go along with the square photos and I used the arrow brads for fun in the center of each page. I bought these arrow brads because they were soooo cute, but I have never used them until now!! I have made several layouts like this (because I take way too many pictures) but I never thought to use brads on the pages until now ~ thanks PS!! Here is my take on the LID 2-page sketch for this week. I turned the first page to fit the orientation of photos I had. 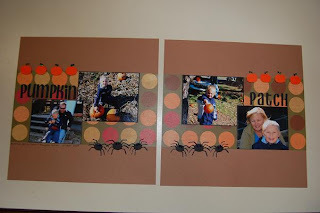 I used my cricut carts Opposites Attract (for the title) and Walk In My Garden for the leaves. This is my take on this week's LID (Laying It Down) sketch from the cricut message board. 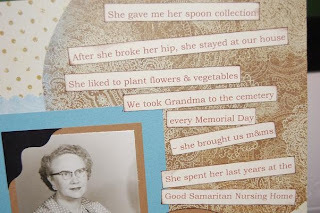 This is my Grandma Johnson ~ we called her Grandma J. The smaller photo is of her holding me when I was a baby (and bald). I plan on doing a similar LO of my Grandpa J to turn this into a 2-page spread. This LO is based on the SOUS (Stuck On Us Sketches) sketch. I spent waaaay too much time on this layout! This was difficult for me for several reasons: First ~ I have all boys and I REALLY wanted to use purple on this LO. I struggled with the shade of purple, how much purple, how to tone it down...you name it! 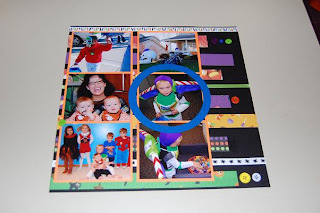 Then, I had to stretch it into a 2 page LO because I could never match purple with any other boy page!! I am also a 2 page scrapper 99% of the time. Finally, I agonized over the title ~ what to use as a title, could I stick a snowman in the title in place of a letter, do I need to title both pages, what color (originally I wanted purple but then black shadow with white and finally just black). I decided to spread the title over both pages. I had to bling it up just a notch just because I could get away with it on a purple LO!! I can't believe I spent half of the weekend on this!!! I could have completed a small album in the amount of time I agonized over this!! Oh well, each page is worth it once it is completed! From my cricut library, I used Snow Friends for the snowmen, gloves, hat and snowflake. I used Winter Wonderland for the square snowflake. I used Ashlyn's Alphabet for the title. 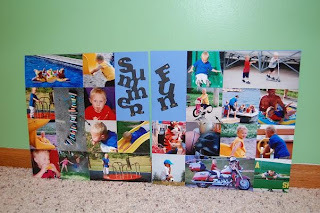 This was a challenge from a Practical Scrapper member (mtnmommyscrapper) and I had sooo much fun putting this all together. It took me several days of gathering the information I needed for this. I wanted to hightlight key words, so I used my computer for those. I used bright colors (the same as my basement) because they make me happy!! 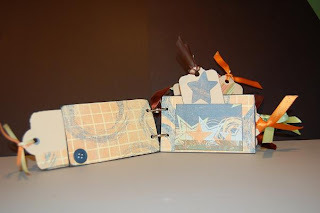 This layout is for the Practical Scrappers challenge: Die Cuts. 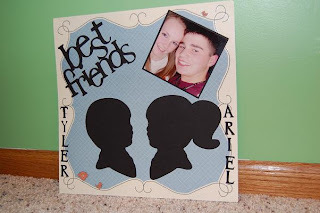 This is my son Tyler and his best friend Ariel. I wanted to make a page for his book that highlighted their friendship. 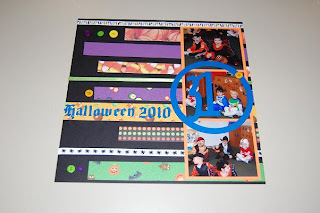 I used the A Child's Year cricut cartridge.